« Could Virtual Line Work At All Major Universal Theme Park Attractions? After roaming the floor of the 2017 International Association of Amusement Parks and Attractions (IAAPA), I saw dozens of new products from animatronics to special effects. However, the most exciting announcement to come out of this year’s event is the All-Terrain Dark Ride vehicle from Dynamic Attractions. 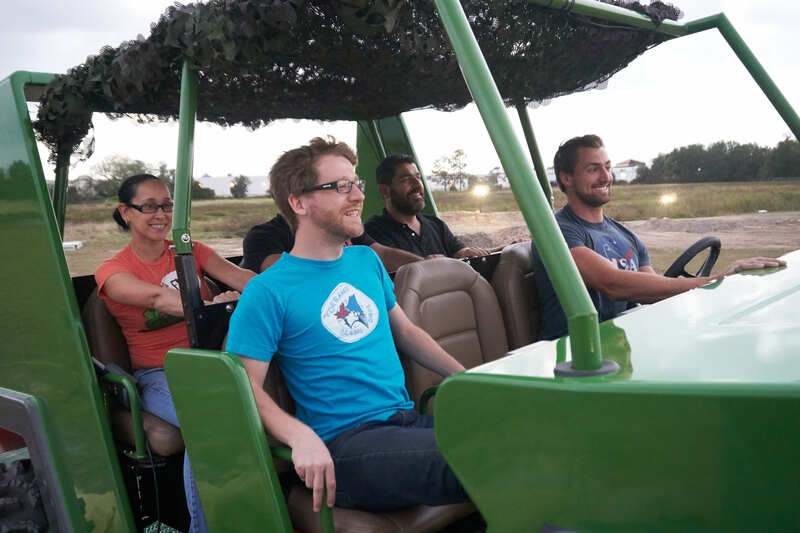 A six-passenger self-guided jeep that can go both outdoors and inside show buildings, can climb up and down hills, cover most types of terrain and can even dodge and swerve around other cars and obstacles to create near-miss moments. At first glance, the All-Terrain Dark Ride system may not seem that exciting. We already have ride systems that are trackless and self-driving cars are found on highways daily. We have seen rides like Radiator Springs Racers at Disney California Adventure have two vehicles racing side-by-side, but is there any real sense of danger since those cars are on a track with a slot in the middle? Over in Skull Island: Reign of Kong, a trackless vehicle can slowly take tight turns and even small inclines. However, that experience is with roughly 50 people. Hardly intimate and terrible sightlines if you’re in the middle or the front of that truck. This new ride system from Dynamic Attractions accommodates smaller groups of six in two rows, meaning you’ve got a far more intimate experience with far better sightlines than a Kilimanjaro Safari or Skull Island vehicle could ever imagine. Most importantly, you really don’t know where this thing is going to go. Think about it. Any other ride system that is outdoors follows a clearly defined path. You know where that vehicle is headed at all times. 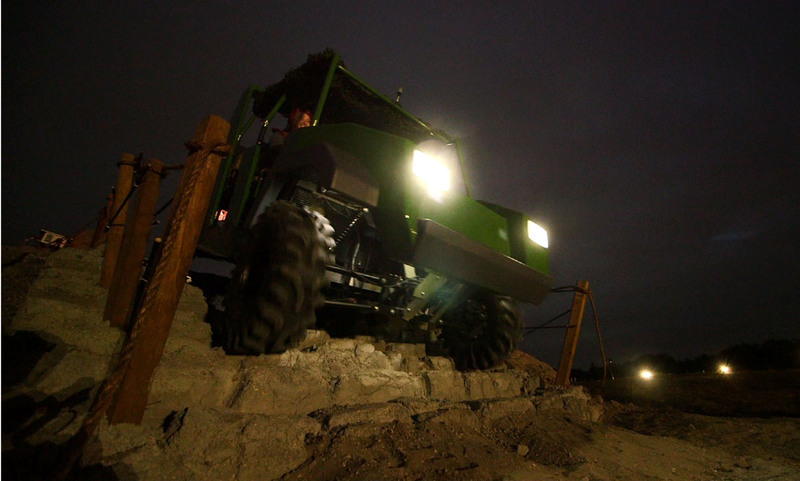 The All-Terrain Dark Ride? You have no idea. Your vehicle could speed up and pass one ahead of your own. It could go under a waterfall. Maybe a hatch opens up in the middle of a field and all the vehicles enter a secret underground bunker! For perhaps the first time in the history of advanced ride systems, you can get a true sense of adventure with the all-terrain dark ride system that hasn’t been possible in the past. I got a chance to chat with George Walker, Senior Vice President of Creative Services at Dynamic Attractions about what else we can expect from the All-Terrain Dark Ride system. Another interesting piece of trivia is the scope of an attraction like this is virtually unlimited. George Walker told me that this kind of system is only limited by your budget. Meaning, the distance to which these vehicles can be controlled is enormous. 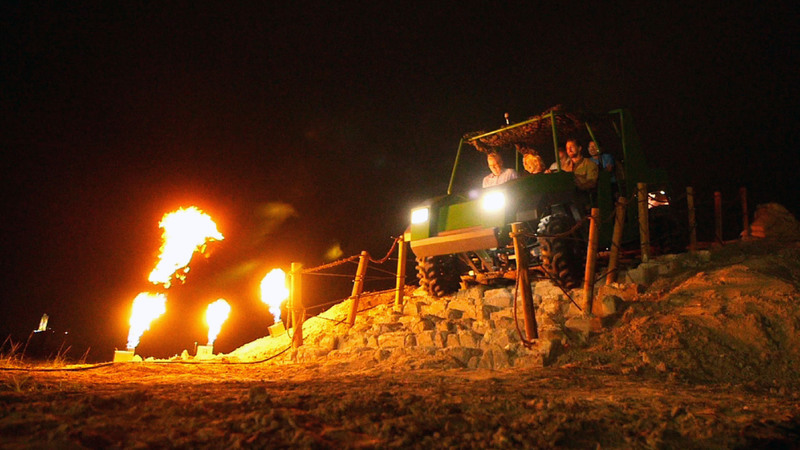 Imagine a Kilimanjaro Safari ride with these smaller self-guided vehicles. Granted, you couldn’t quite get that close to the animals with an open-air vehicle this low to the ground. 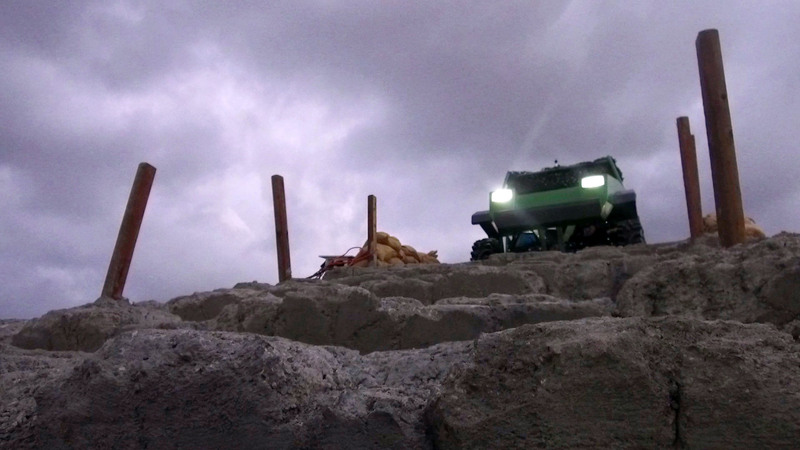 On the other hand, could you build a Jurassic World attraction where you drive around in Jeeps dodging animatronic dinos? Yes, you absolutely could. More importantly, the amount of vehicles used in an attraction like this is only limited by budget and space. You could dispatch eight of these vehicles at a time if you’ve got the space for them to maneuver around and the budget to do so. It’s also important to recognize the difference between the All-Terrain Dark Ride vehicles and self-driving technology like a Tesla. Self-driving technology used in certain vehicles found today is designed to be boring. The idea is to get you from point A to B in the safest way possible, preventing damage to you and the vehicle. However, this new ride system is designed to thrill and surprise you, while still keeping you safe. You can go across terrain like grass, “rickety” bridges, through tunnels and inside buildings. Something (hopefully) your self-driving car would never do. It doesn’t look like we are going to have to wait long to get an announcement about the first All-Terrain Dark Ride opening either. All over the Dynamic Attractions booth at IAAPA there were signs promoting G.I. Joe vs Cobra, but no direct link to this new ride system. “All I can say is that it’s a top-secret project. The most natural fit for a ride system like this is an adventure with good guys versus bad guys. If that doesn’t sound like G.I. Joe, I don’t know what does,” according to George Walker. We are going to be talking about several new offerings from Dynamic Attractions in the near future, but I wanted to give you a glimpse into what I think will be the next big first-of-its-kind ride system. Certainly, we will be covering the announcement when it officially comes out about this G.I. Joe attraction, but until then what are your thoughts? Is this something you could see a lot of potential in for a theme park? Or is it too similar to other ride systems? Let me know on social media by using our hashtag “#IReadTheEntireArticle“! This entry was posted in Theme Parks 101 and tagged All-Terrain Dark Ride, dark ride, Dynamic Attractions, G.I. Joe. Bookmark the permalink. Trackbacks are closed, but you can post a comment.